Today we went and drove up to Cotopaxi. On the way we stopped at a place kind of like a desert. There were some rocks and under them were some things like a scorpion, but Daddy and I didn't know what they were. And then, I named them the tiger scorpions because they have black and orange stripes and they look like a scorpion. There was some really deep water and Daddy and I thought about going through it in 4 wheel drive low. Then we thought we might get stuck so we turned around. But another truck on the other side went through and we wanted to make sure they could make it. One of the people in that truck found the skull of a spectacled bear. We saw a condor by the lake and some wild horses. 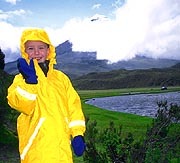 School Notes - Cotopaxi National Park is 100 kilometers (65 miles) south of Quito. 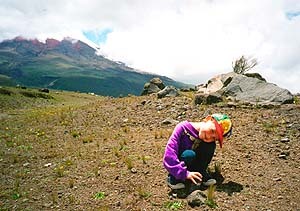 Much of the park lies in the alpine, or paramo, but also consists of the original Andean forests. It provides refuge for condors, spectacled bears, pumas, wolves, foxes, rabbits, capybara and feral horses. Cotopaxi is one of the world's highest active volcanoes at 6,000 meters (19,342 feet).